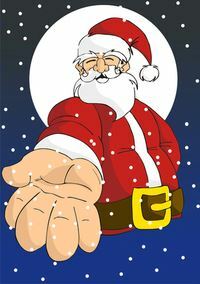 It is a documented fact that the only way for Santa to deliver all the toys on Christmas Eve is to use magic. How else can he make it around the world and stopping in a billion homes in just under 12 hours? Maybe he got the magic from the elves or maybe he found it in the North Pole. Either way, this is one delivery service that works fast. Wouldn’t it be nice to have a little of that magic at your disposal around the holidays? It can certainly help with the cookie baking and gift-wrapping. Of course, when it comes to cleaning up your cluttered home you don’t need magic. You just need to call Junk King. Let them work their magic around your house! Junk King provides a two-man moving crew with every junk removal appointment. That crew will be rolling up in their a huge truck. It’s the same size truck you might use on your next move. In other words, it is going to hold whatever you’re tossing out. The Junk King crew assigned to your task will be taking care of all heavy lifting. You certainly don’t want to throw out your back before the holidays. Don’t hesitate asking that crew to help you move things out of the garage, spare room or up from the basement. This is what you’re hiring them for and they are happy to do the job. A Junk King crew won’t spend a lot of time at your home. That’s a good thing! On most jobs, they can be in an out in less time than it would take you to read your morning newspaper. However, their work is far from over once they leave your place. That’s because they’ll be making extra drop offs to places like charity thrift stores or church groups. Junk King knows that these organizations are always in need of furniture, clothing and other household goods. They’ll see to it that nothing gets thrown out that can be used again. That’s a great thing to have happen at this time of the year. Are you ready to clean up your cluttered home? Then Junk King will be ready for you! This entry was posted in Palm Beach Junk Removal and tagged cluttered, Junk King, junk removal on December 24, 2015 by Dave Archer. Last updated July 31, 2017 .